The adder, Vipera berus, was one of the first venomous snakes formally named by Linnaeus in 1758. 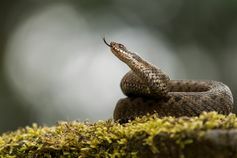 It is the most northerly occurring snake, and one of the most widely distributed species, found everywhere from the UK to Sakhalin island, Russia. It is also the only venomous snake in Great Britain. Despite this, centuries of bad press for the adder, ranging from folklore to Shakespeare, have left its mark. You may be forgiven for thinking that adders are becoming a serious problem in the UK after several high-profile headlines this summer. While not as sensationalist as those relating to false widow spiders, there certainly seems to have been a spike in the number of adder bites, perhaps encouraged by periods of hot weather as late as September. Given that this may be a more regular feature as climate change takes hold, should we be worried about the abundance of the adder? The answer is yes, but not because of an increase, rather because the adder is in widespread decline, particularly in the UK. Despite being described as of “least concern” in the IUCN red list of threatened species, recent reports from the Netherlands, the UK and other parts of western Europe show drastic regional drops in numbers. 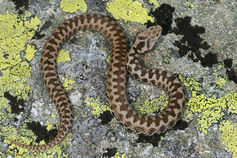 The fall in adder numbers is frequently attributed to the same suite of factors: disappearance of their habitats, increasing isolation and a decrease in the quality of the remaining habitat resulting from over-zealous management, an increase in disturbance from recreation on prime adder habitats, and deliberate persecution. But it’s not just that: a lack of attention to species that continue to be widespread but are declining in number is a wider conservation problem, not least because the occasional encounter with a charismatic animal tends to leave a lasting impression, making it appear more common than it really is. Adders have had some level of protection in the UK for 15 years: their trade was banned in England and Wales in 1981, while additional amendments in 1991 – and 2004 in Scotland – stopped intentional killing and injuring of them. European legislation also covers the adder, and yet they have continued to decline to the point that they are now extinct in some counties, such as Warwickshire and Nottinghamshire, and only found in small isolated pockets of suitable habitat in others. Even populations which are hanging on are smaller than they were 12 years ago. Somehow, management that is benefiting other reptiles is not working for the adder. While it may be tempting to attribute the decline to poor public image, it is more likely that the adder is much more fussy about its requirements than other species. They are a species on the edge in more ways than one, preferring to occupy the boundaries between scrub – which they use for cover – and more open heathland or chalk grassland, which offers foraging and basking opportunities. They prefer mid-successional vegetation stages that, if left to their own devices, would gradually turn into woodland and therefore require active management to keep them at the right stage. In short, a lot needs to be right if a habitat is to play host to a healthy adder population. Moreover, access to a suitable place to sit out winter frosts is essential, and destruction of such shelters can rapidly eliminate an existing population. Meanwhile, many areas which formerly did, or could, support adder populations are managed with other species in mind, using practices which are directly or indirectly detrimental to adders. Increasingly regular burning of moorland for grouse management is one obvious example, but even the maintenance of a short and open sward to favour orchids can be counterproductive for adders. The distinct pattern of the adder makes it stand out from other species. But apart from the handful of experts and enthusiasts engaged in keeping the adder alive, does anyone else care? UK conservation bodies are currently constructing a national “Red List” and the adder is likely to be listed as at least “vulnerable” to extinction. This, along with other forthcoming reports, may finally make the adder a priority species, one that needs to be considered when designating protected areas and in designing their management plans. For those less than enamoured by the thought of an adder in their midst, bear in mind that an adder bite can be treated effectively by using anti-venom. Ultimately, we all need to cultivate a more informed attitude to risk. The last recorded human death in the UK from an adder bite was in 1975, and between 2004 to 2010, there were only 510 snake bite enquiries to the UK national poisons information service. Interestingly, bites by the adder accounted for only 52% of these cases, with bites by exotic species presumably being kept as captive animals accounting for the largest proportion of the remaining bites. On the other hand, an NHS report on the number of people bitten by dogs shows that in 2009-2010 alone, dog bites were responsible for 5,914 hospital admissions in England, with at least 21 fatalities during the last 10 years. Now who’s the snake in the grass? Anita Malhotra does not work for, consult, own shares in or receive funding from any company or organization that would benefit from this article, and has disclosed no relevant affiliations beyond the academic appointment above.